General Admission: $35. General Admission 4-Pack $120. Designated Driver (no alcohol sampling): $10. 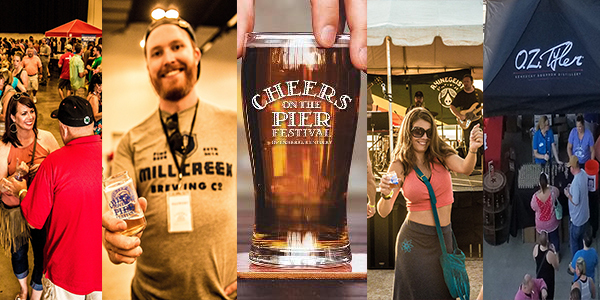 Cheers on the Pier is back! Saturday, August 18 from 3PM to 7PM at the Owensboro Convention Center! Over 30 breweries featuring over 75 craft beers, some local wines and a bourbon too! Enjoy all the libations and LIVE Music on the Pier Stage. Whether you’re a beer expert or you don’t know ale from a pilsner, there will be something for everyone! Educational and most enjoyable! Check out more info at www.cheersonthepier.com! Tickets (Ages 21+ Only): General Admission: $35. General Admission 4-Pack $120. Designated Driver (no alcohol sampling): $10. Additional processing fees apply to all ticket sales. Valid photo ID required for entry. No on under the age of 21 will be admitted, including infants – no exceptions. No outside food or beverage is allowed into the Event. Cash concessions and bars will also be available for on-site purchase. The Craft Beer Festival will be held rain or shine. In case on inclement weather, the Festival will be held indoors. The venue and Festival Staff reserve the right to limit alcohol consumption and require attendees to leave the grounds due to illegal and/or inappropriate behavior. We encourage responsible alcohol consumption. Please designate a driver or call a driving service. All smoking, including electronic cigarettes, is not allowed indoors at the venue. However, there are designated smoking areas outside that will be clearly marked the day of the Event.